A tummy tuck, also known as abdominoplasty, is designed to remove loose, excess skin around the abdomen while repairing any stretched or torn abdominal muscles, resulting in a smoother and flatter abdomen. This is done to resolve the look of a hanging or protruding abdominal profile for a sleeker and more defined body contour. Often, the effects of pregnancy, weight fluctuation, gravity, the aging process, and genetics can cause skin laxity and a separation of the abdominal muscles from their original position. Many individuals find that dieting, exercise, and toning efforts do not adequately improve these concerns, or only produce limited results. Tummy tuck surgery performed by experienced plastic surgeon Scott Miller, MD can remove loose abdominal skin and tighten stretched musculature to flatten the abdomen and slim the waistline. If needed or desired, liposuction can also be incorporated during surgery to reduce localized pockets of stubborn fat in the area. For women who have had one or more pregnancies, a tummy tuck can be an essential part of regaining a pre-pregnancy figure. Weight gain, weight loss, and repeated stretching and scarring of the abdomen can take a tremendous toll on the body after multiple pregnancies. By repairing the abdominal muscles with a tummy tuck, women can achieve a tighter appearance in the abdomen that dieting and exercise alone could never accomplish. Depending on your individual cosmetic goals, Dr. Miller may recommend combining a tummy tuck with one or more additional procedures for a comprehensive Mommy Makeover. The tummy tuck procedure begins with an incision made across the lower abdomen, just above the pubic area and beneath the bikini line. An incision may also be made around the belly button. At this time, the underlying abdominal muscles can be tightened, providing a stronger abdominal wall and reducing overall waist size. The skin and fat between the pubic area and the belly button is usually removed, and any loose tissue from above is pulled down and to the center. Finally, a new opening is made for the belly button at the proper position. The entire abdominoplasty procedure generally takes about two to three hours to complete, but this may vary based on a patient’s unique needs. On the night of surgery, you will be provided with a caregiver and hotel stay. With the help of a close friend or family member, most individuals are able to return home the day after their surgery. As liposuction and tummy tuck surgery are two of the most popular procedures to improve the look of the abdomen, many patients have questions regarding which of these body contouring treatments can fulfill their goals most effectively. In general, a tummy tuck is usually the most effective treatment for patients who wish to tighten loose or sagging abdominal skin. If you experience a bulging abdomen in spite of good exercise and lifestyle habits, this may be a sign of separated musculature — a concern which can only be resolved with tummy tuck surgery. In contrast, if stubborn fat pockets in the abdomen are the main reason for treatment, liposuction may be enough to achieve your desired aesthetic. Liposuction can remove excess fat for excellent results, but it’s only suitable for men and women with minimal to no skin sagging and good skin elasticity. Both procedures can also be performed together to achieve the best possible outcome. Ultimately, the best way to determine the most ideal procedure for your needs is to schedule a consultation with Dr. Miller. He can provide his recommendation after your needs are evaluated. Together, you both can decide which treatment to pursue. 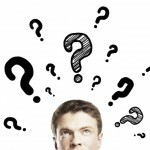 What is Recovery From a Tummy Tuck Like? Dr. Miller and his team will provide detailed after-care information regarding your medications, approved activities, and the nature of the normal healing process. The role you play in the recovery period is pivotal to your results and following Dr. Miller’s post-operative instructions can help ensure scars heal properly and minimize the amount of downtime necessary. 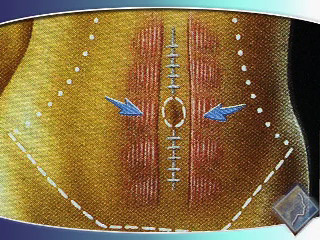 Following surgery, a firm elastic dressing is placed over the treated area and medication is provided to alleviate soreness and discomfort. You may experience tightness, tingling, or numbness, but these reactions are normal and should dissipate as your recovery progresses. Patients are typically up and walking around in a day or two, although movement should remain limited to light activity and short periodic walks. After about one week, most individuals can expect to move around normally but strenuous activity should continue to be avoided for three to four weeks. Scars and incision marks usually fade over time; within three to six months, any visible scarring should be flatter and lighter. Additional instructions will be provided at the time of operation. By removing the sagging, excess skin of the abdomen and repairing stretched or torn musculature, patients can enjoy a flatter, firmer abdomen as well as a thinner waistline. While the procedure is designed to provide a long-lasting result that does not require retreatment, patients can further extend the longevity of the cosmetic outcome with healthy lifestyle and exercise habits. What Will My Scars From Tummy Tuck Surgery Look Like? The scar from a tummy tuck may extend from hip to hip and will be placed low on the pubis, just below the bikini line. This inconspicuous location generally allows the length of the scar to be easily hidden by most types of underwear or bikini bottoms. For patients receiving a mini tummy tuck, which is a less extensive version of the full abdominoplasty procedure, the incision and resulting scar are typically shorter. Dr. Miller will give you instructions on proper wound-care to encourage the best healing of your incision, increasing the likelihood that the scar will flatten and fade to some extent over time. Abdominoplasty is very popular among women who have experienced pregnancy and wish to repair stretched abdominal muscles for a smoother and flatter abdomen. However, Dr. Miller also receives questions from patients wondering whether it is advisable to pursue a tummy tuck before getting pregnant. From a medical standpoint, pregnancy before tummy tuck surgery is certainly possible, generally without a risk of harm to you or the developing child. With that said, most board-certified plastic surgeons advise waiting until after you have completed your family to undergo abdominoplasty. of the musculature and skin that occurs with childbearing can reverse the outcome achieved with the initial abdominoplasty, typically recreating the aesthetic concerns you sought to resolve in the first place. This is why Dr. Miller recommends postponing a tummy tuck until after you have no future plans for pregnancy to help ensure lasting results that you can enjoy indefinitely. A tummy tuck is priced according to the extent of your concerns and the overall complexity of your procedure, with the total cost including fees for the anesthesia, surgeon, operating facility, and post-operative care, among other expenses. For this reason, the cost of tummy tuck surgery varies depending on the details of each patient’s treatment plan. It is impossible to give an accurate cost estimate of the procedure without knowledge of your unique needs, but rest assured that our patient care coordinator will provide a personalized quote after your consultation with Dr. Miller. Our practice accepts plastic surgery financing from CareCredit®, a trusted healthcare lending company that can help you make the cost of a tummy tuck more affordable. After being approved through the simple application process, qualified patients can choose from a range of payment plans with low monthly installments and no interest rate options. This allows countless men and women to recieve their desired treatment while accommodating their budgetary concerns. For more information about the cost of tummy tuck surgery, please call our practice to speak to a member of our team. The best!!!! He did my tummy tuck a few years after having twins. For more information about tummy tuck surgery, or to schedule a consultation with Dr. Miller, please contact our office today.